Mulvey School No. 1, a two-storey, two-room brick veneer structure at Maryland and Broadway, was named in commemoration of politician Stewart Mulvey. 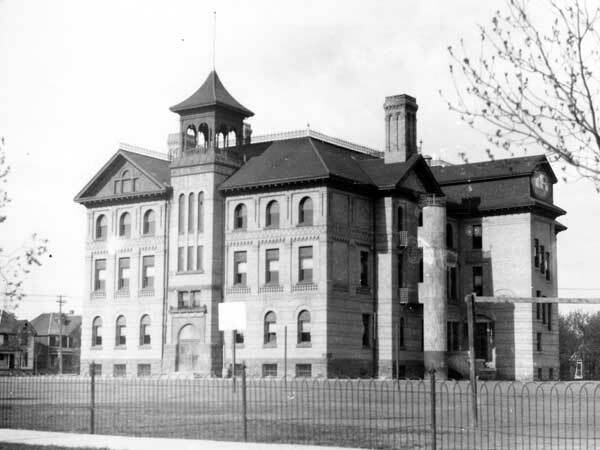 The school, designed by Winnipeg architect C. A. Barber, opened in October 1884 with 47 students. With no central furnace, classrooms were each heated by a box stove around which students would cluster during cold, winter days. The building was used until 1893 when a three-storey, ten-classroom replacement was constructed at the same site, on a design by local architect George Browne. The third floor of Mulvey School No. 2 was used by the provincial government as a museum, where its exhibit from the 1893 Chicago World’s Fair was displayed. For two years, classes of the Central Normal School were also held in the building. On 9 April 1895, a fire started in the museum and spread to the entire building, destroying it. The cause of the fire was never determined. 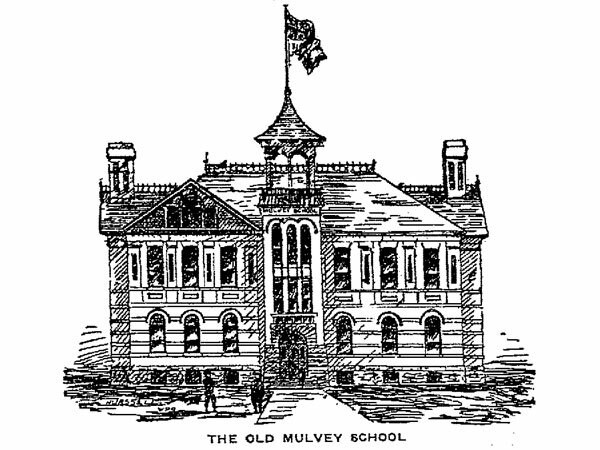 While a replacement building was erected, students attended classes in Mulvey School No. 1, which remained at the site, or in Carlton School. Mulvey School No. 3, completed in late 1895 and largely resembling its predecessor, had 12 classrooms and an assembly hall. In 1907, Mulvey School No. 1, which had been used to that time as a manual training centre, was demolished. By 1908, overcrowding of Mulvey School No. 3 necessitated the addition of nine more classrooms and, in 1922, the assembly hall was divided into two classrooms, allowing the building to accommodate up to 900 students overseen by a staff of 21 teachers. The present Mulvey School—the fourth structure to bear that name—is situated at the corner of Maryland Street and Wolseley Avenue. Built in 1925, and known originally as Gordon Bell Junior High School, it became a Senior High School in 1932. When a new building for senior students was erected in 1956, adjacent to Mulvey School No. 3, the Gordon Bell name was given to the new school, Mulvey School No. 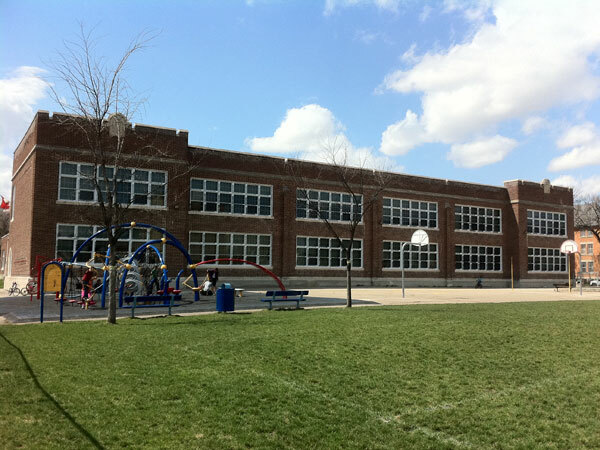 3 was demolished, and this building became Mulvey School. 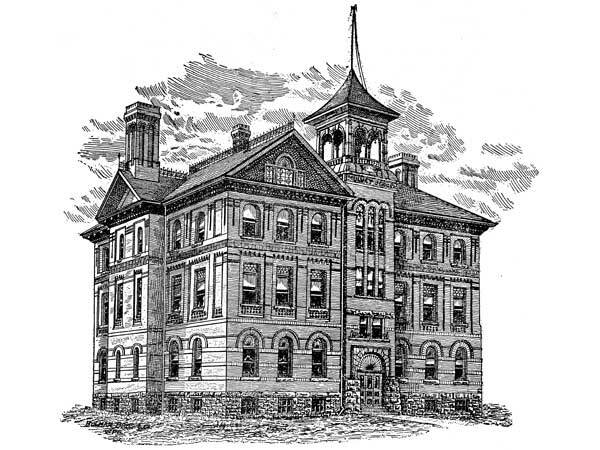 Among the noteworthy students who attended Mulvey School were C. Rhodes Smith, D. G. Potter, C. G. McKeag, Carlyle Allison, O. C. Kellough, C. S. Riley, H. J. Riley, Norman Andrews, and J. D. MacVicar. Margaret E. Monteith, Grace E. Palmer, ? Source: Manitoba Free Press, 21 October 1922, page 11. Source: Archives of Manitoba, Winnipeg - Schools - Mulvey #3. “Winnipeg schools, No. 5—Mulvey,” Manitoba Free Press, 21 October 1922, page 11. “Short-lived rejoicing follows fire in second school” by Claire Tisdale, Winnipeg Free Press, 28 January 1949. Obituary [Sarah Blakely-Moore], Winnipeg Free Press, 11 January 1989, page 43. We thank the Winnipeg School Division and Peter Correia for providing additional information used here.